Did you recently big chop and need a little inspiration as you embark on your natural hair journey? If so, this is definitely a list you want to save and bookmark for later. While there are several popular vloggers with long, flowing curls, we realize that naturally curly women come in all different lenghts and textures. As a result, we are shining light on some fabulous TWA (teeny weeny afro) vloggers you should get to know and follow. If you have seen a TWA tutorial chances are you have come across Paville. Her super chic style and hair will make anyone want to big chop. Need a quick fix for your failed twist out? She has it covered! Carmen from My Natural Sistas has provided great TWA videos for years and recently posted a detailed tutorial on trimming your natural hair at home. As one of the faces of The Mane Choice hair products, Ciara has several videos ranging from finger coils to how to install clip in extensions. Love the versatility. Although Kendra recently received a tapered cut she has one of the best Bantu knot tutorials for short hair I have seen to date, plus a lot of extra fun videos for protective styles and make-up. With a recent cut and color that would even make Amber Rose look twice, this beauty vlogger is on her third big chop. Her videos also address great tips for color treated hair. As a five year vlogger, Kerry is on her second big chop so she is definitely someone to follow. Her complete natural hair journey from big chop to mid-back length and back to TWA over the past five years is all available on her YouTube Channel. This freelance MUA and hairstylist big chopped two months ago and already have amazing tutorials on her channel. Her finger coils area also marvelous. Updos, wash and go's, faux locs, and high buns are just a few tutorials Traeh has on her channel so she has a little something for everyone with a TWA. She also has the cutest tutorial with her daughter inspired by the new DreamWorks movie HOME. 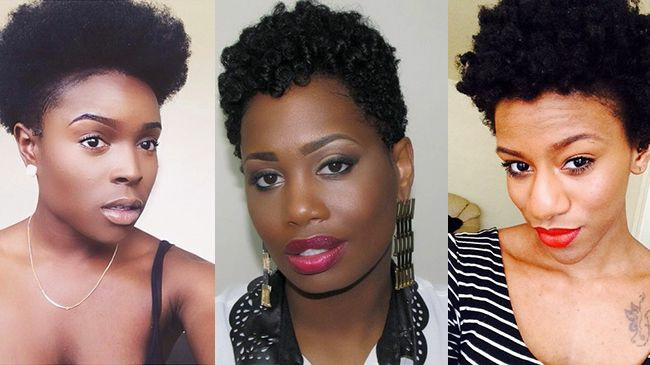 If you thought there were only a few styles to do on your TWA, Sadora is definitely someone to follow. She has transformed her hair from a traditional TWA style to tapered cut with shaved sides and an incredible undercut. After a bad experience with a relaxer, J Mayo started her natural hair journey over again and is now on her third TWA. We love her blonde curls and minimalist approach to her styling. From natural hair to relaxed, tex-laxed and back to natural hair again, Anna’s journey is documented via YouTube over past three years. Since she ultimately preferred natural hair, she is on her second big chop and dishing out great TWA styling advice. Ever wondered how that fabulous style is holding up after day one for your favorite vlogger? Vee provides extremely detailed videos on her TWA routine and follows up to show you her second, third, and fourth-day hair. We also love her extremely honesty reviews of each product. Who are your favorite vloggers with TWA's?